At the end of September I travelled to Sydney for the Australian Sewing Guild annual convention. I joined the Guild around 12 months ago with the specific intention of going to the convention, and I’m very glad I did. I had a really good time, and I can thoroughly recommend the event to anybody else considering going. Held at the Shore Grammar School in North Sydney, the event was a full week of sewing, with no cooking, no cleaning, and no washing up! Absolute bliss! I did workshops with Lorraine Parker, Larraine Jenkins, and Leanne Abbott (there were some tuturs whose names didn’t begin with L, I just didn’t pick them!) 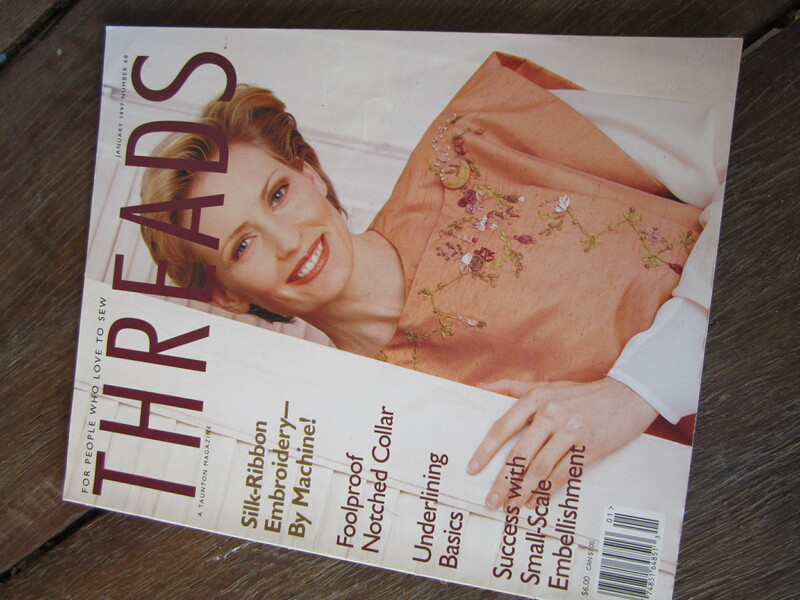 Textile manipulation and embellishment, some seriously useful tips for things like turning collars, and lots to do with buttons, including bound buttonholes. Unfortunately I did come home with another UFO, which I had promised myself I wouldn’t, but I have since finished it, just need to take some photos and then I can blog about it. Apart from the sewing, I really enjoyed being a tourist in Sydney. I had not been before, apart from about half a day some 20 years ago, which I spent looking at the Opera House, and Darling Harbour. This time I still only got to see a small part of Sydney, the area around the school in North Sydney, and a walk across the bridge to The Rocks, but I was fascinated. I walked around almost with my mouth open looking at all the old buildings! 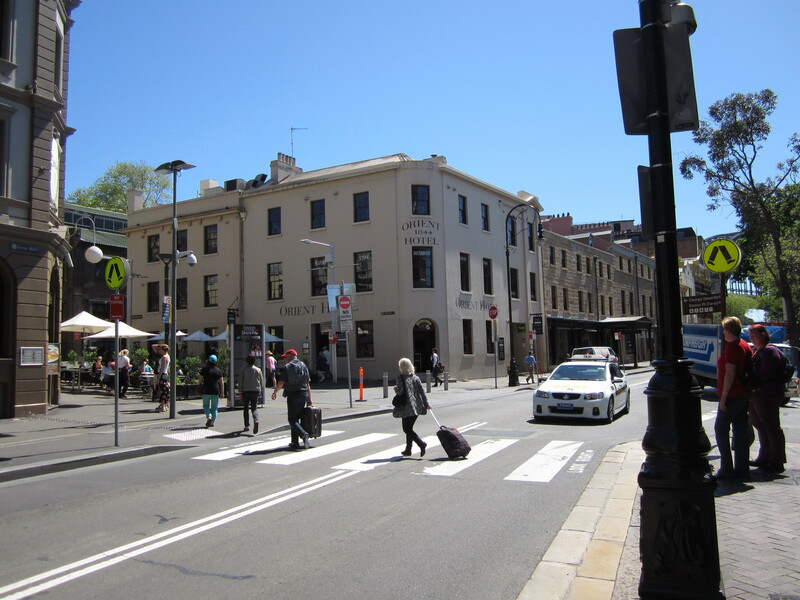 Alright, I know that in the overall scheme of things Sydney isn’t old, but coming from Perth it looks positively pre-historic. I grew up in England, living in houses which were one or two hundred years old, in one case probably even three hundred years old. And I’ve hardly seen buildings that old since. Perth was settled in 1829, and most of the original buildings have gone now. In the Rocks there were little cottages which might have come straight from any number of cities in England, logical I suppose since the people who built them had only just come from England, or the UK at least. 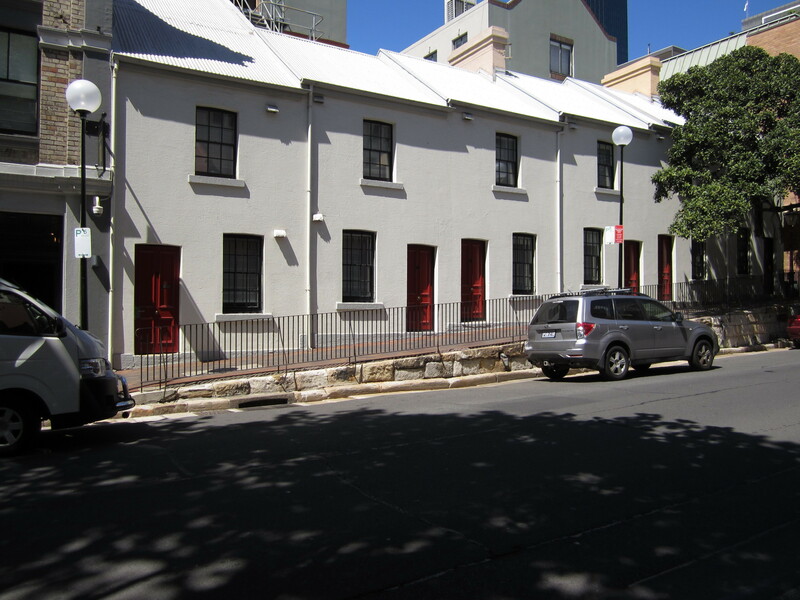 Even the old buildings which are left in Perth have an Australian flavour to them, showing the evolution of building styles to suit the climate in the new country I suppose. Next year’s convention will be held in Brisbane, and if you are interested in sewing I can recommend it. One of the ‘Inspiration in Every Issue’ projects I did finish, but have not yet written about, was inspired by issue number 68. 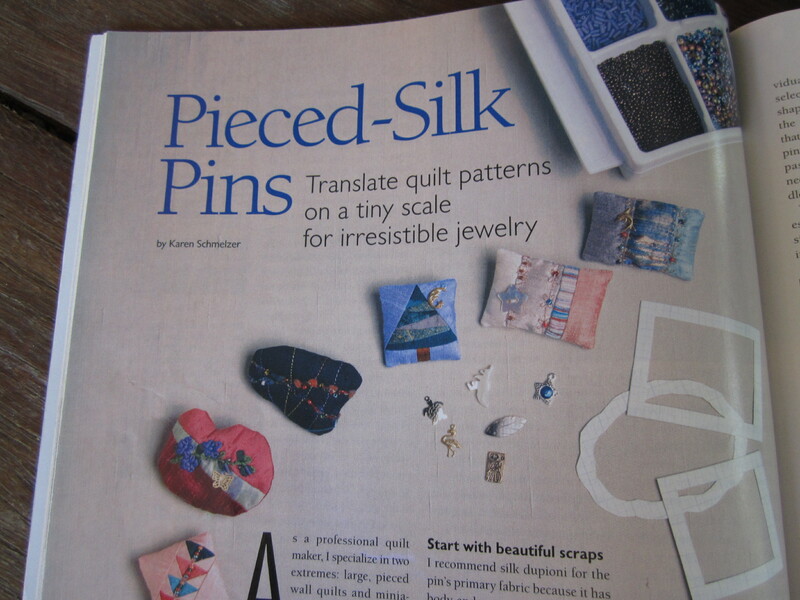 There was an article entitled Pieced Silk Pins, by Karen Schmelzer. Her pins, which are what English and Australian people call brooches, were intricately made in silk, and more complicated than mine. She says they are generally about 2.5 inches in size, and one of the examples in the photograph has a beautiful strip of ‘flying geese’ across the middle of it, which must have been quite a challenge. Mine are no bigger than hers, in fact only about 2 inches square. I didn’t go for such complicated piecing though. 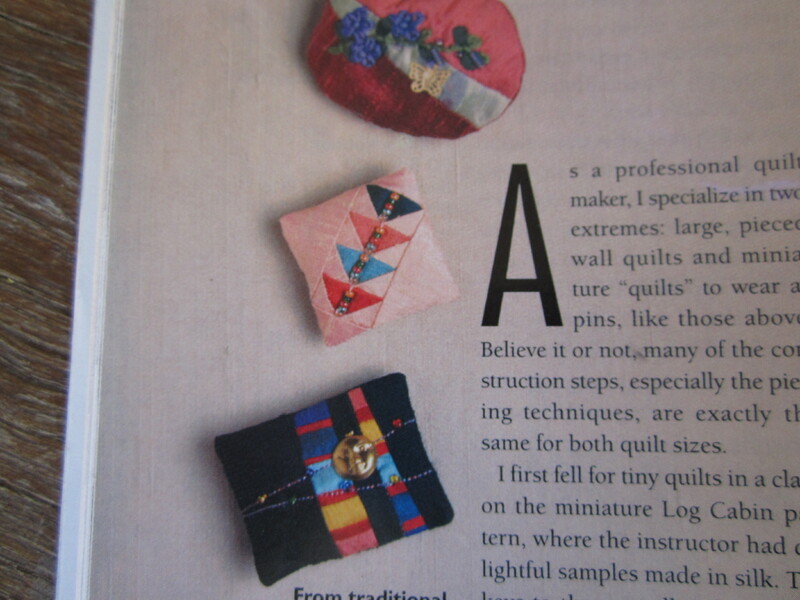 Strictly speaking I think they would all be classified as ‘crazy quilting’, since they are not even or regular. I made one based on a log cabin pattern, but without being square or regular, and the other two are just randomly pieced. 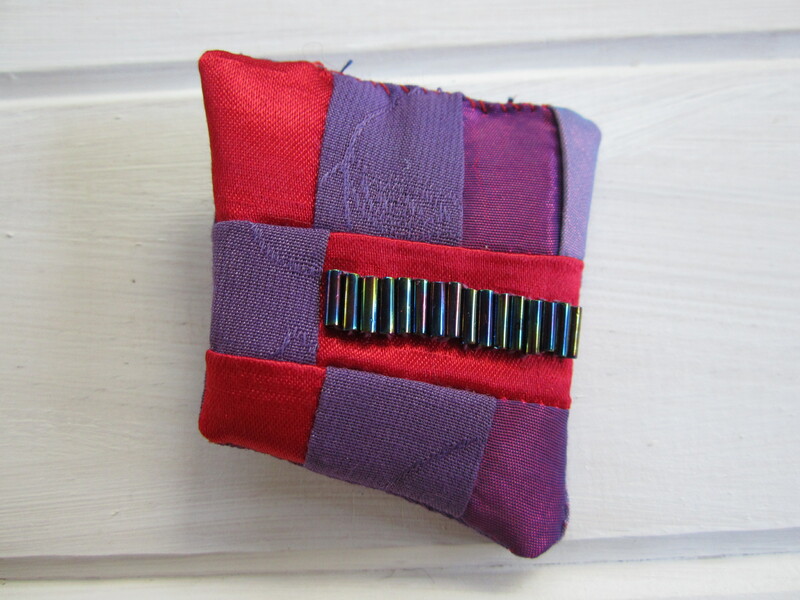 I also decided that it would be easier to make the brooches themselves just random shapes, instead of aiming for the perfect square or rectangle. 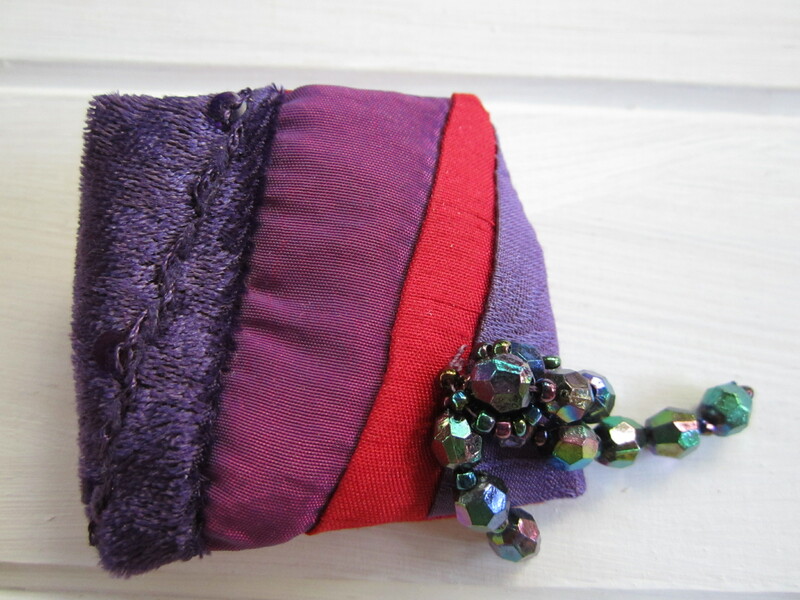 I added some beads for decoration, and sewed brooch pins on the back. Actually before sewing on the pins I pressed them, and that made a huge difference. What started out as a squishy odd-shaped lump became a quite flat, smooth and relatively even object, which looked quite professional, and like the pictures in the magazine! 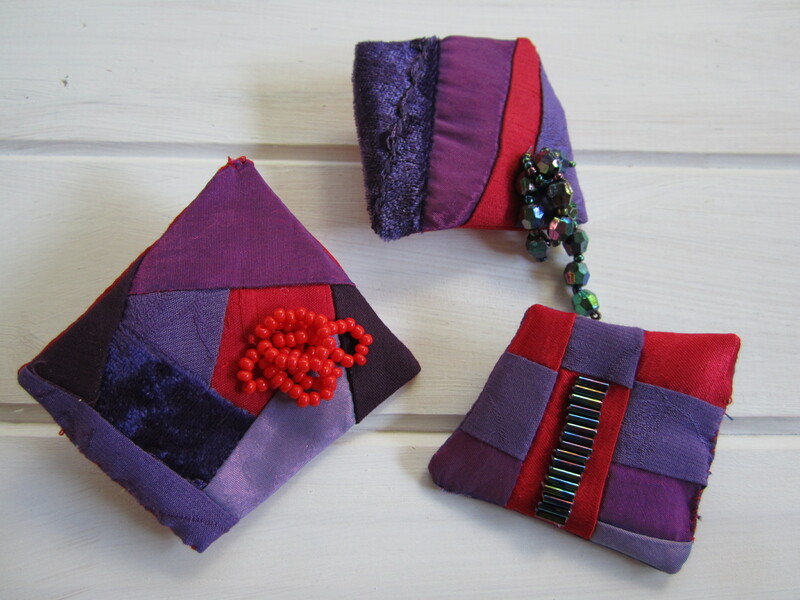 Two of the brooches I gave away as gifts at our Red Hat chapter’s Christmas gathering, (that’s why they are purple and red) and kept the third. 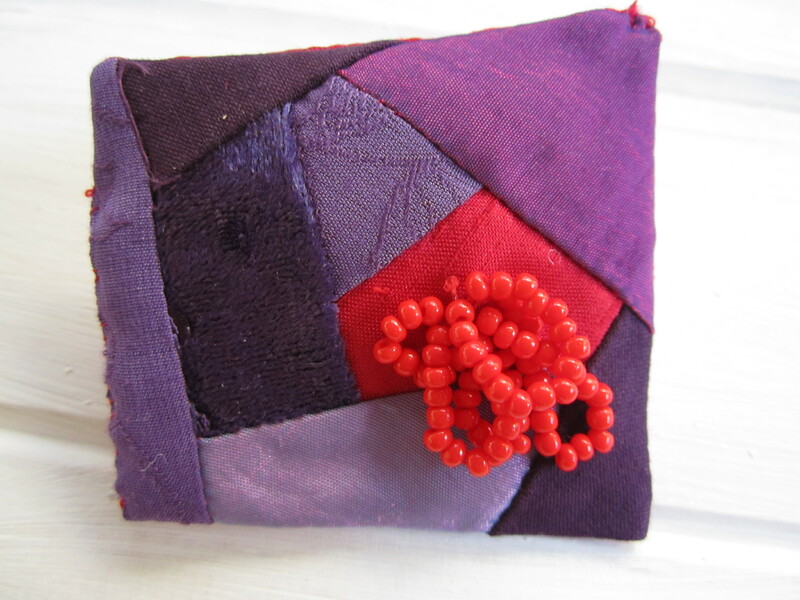 I would certainly have a go at making some more, they are quite satisfying, and use up tiny scraps. And here are some shots of the magazine and the original article. How I wish I knew how to make WordPress align text and photos on the page where I want them to be! I’ve even tried playing with the html, since I am learning (trying) to build websites at the moment, but I still can’t get it to look the way I want it. How hard can it be?! Back again after another long hiatus in my blogging career. However, I’m looking at the positive. I think it’s like giving up smoking, or being on a diet, just because you fail doesn’t mean that you shouldn’t try again, and maybe each failure increases the chance of success next time. For those who don’t have any idea what I’m talking about, I mean my efforts to blog regularly. I have tried in the past, but generally not managed more than one or two posts per month, and there have been longish periods with no posts at all. I am going to try again. Last Saturday was writing group, which is something else I haven’t been paying enough attention to lately. The topic we had been given was refugees, but I wasn’t brave enough to write about that. Others did, and there were some very interesting pieces, including the information (which I think is correct) that Afghanistan has been the top refugee producing country in the world for each of the last 32 years. Makes one wonder why? Anyway, I am not going into that now. I didn’t write anything until almost the last minute, which I often do, and then struggled to find something to write about. Until I browsed through the folder on my computer and found a piece I had started some time previously when I went to a performance of Beethoven’s Ninth Symphony. I was able to polish it up a bit, and took that along. It went down OK, and I’m posting it on this blog under articles, but I wonder what I could do with it. Not much, I fear. I’d quite like to be somebody who has a weekly column in a newspaper or magazine, writing about incidents in everyday life, but for reasons as discussed above, I’m not sure that would work very well! I guess having to write something to send in every week would focus the mind somewhat! Who has any good tips for blogging/writing regularly?